29/4/09 – Acquisitions – Amsterdam, Rijksmuseum – Although in France the idea of establishing a tax on lotteries, even creating a specific lottery to create revenues for the restoration of historical monuments, or acquiring art works, is brought up on a regular basis by the government without having yet taken any measures to do so, other countries already avail themselves of this source to enrich their patrimony. Thus, the Rijksmuseum has recently added five sculptures to its collections thanks to the Dutch cultural lottery, BankGiro Loterij. Artus I Quellinus, Greyhound (ill. 1). 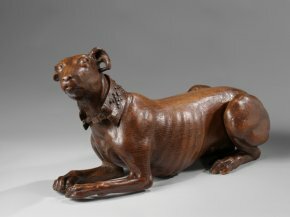 This wooden sculpture, life size, is no doubt the “portrait” of a dog belonging to the Roose family in Amsterdam, as its arms are shown on the collar. 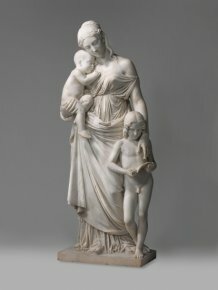 The sculptor, a son of Erasmus I Quellinus (1584-1640) was born in Antwerp and studied under his father. During a stay in Rome, with dates not known exactly, he worked in François Duquesnoy’s workshop. He produced many busts, sculpted décors (particularly the famous one in Amsterdam City Hall) and funeral mausoloeums. This kind of isolated animal piece is very rare in Flanders. This one was presented in 1977 in Brussels during the exhibition La sculpture au siècle de Rubens  (cat. 130), but the monogram A.Q. was not enough at the time for the authors to determine if the attribution was by Artus I or Artus II Quellinus (1626-1700), his cousin. François Lespingola, Hercules Helping Prometheus (ill. 2). 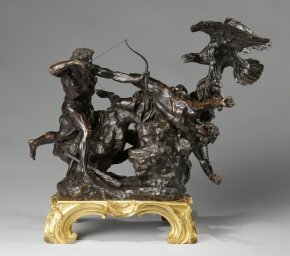 The exhibition Cast in Bronze : French Sculpture from Renaissance to Revolution recently organized at the Louvre, and currently in New York before traveling to the Getty Museum (see our review) highlighted Lespingola by displaying most of the known models for his bronzes which illustrated the labours of Hercules. Hercules Helping Prometheus was represented by a replica held in Dresden (Staztliche Kunstsammlungen) and the Rijksmuseum has just acquired another version. This group is an essential element in the reconstitution of the artist’s oeuvre as this is the only model quoted in the inventory after the artist’s death. Let us point out that the freeing of Prometheus by Hercules is not one of the twelve labours. Prometheus, by way of thanks for saving him, explained to Hercules how to steal the apples from the Garden of the Hesperides. Louis-Simon Boizot, Offer to Venus and Offer to Ceres (ill. 3 and 4). 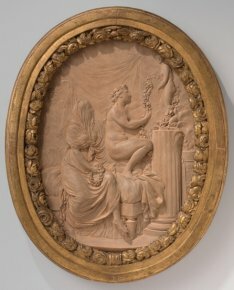 The artist, Prix de Rome in 1762 with The Death of Germanicus, directed the sculpture workshop at the Manufacture de Sèvres from 1773 to 1800. He enjoyed an exhibition in his honor in 2001 at the Musée Lambinet, accompanied by a catalogue raisonné . These terracotta reliefs are unpublished. They came up for auction in Paris at Binoche & Gaudeau Giquello (as Spring and Summer) on 14 November 2007 where they were sold for 135,000€ (without charges) to the London dealer Daniel Katz who sold them to the museum. They are from 1766, that is during the trip to Rome and constitute therefore the first found works by the artist . The iconography of these two relief and their frames (Venus, also a symbol of Spring, is surrounded by flowers ; Ceres, summer, by wheat ears) would imply that it included Autumn and Winter. The style and subjects are influenced by the painter Joseph-Marie Vien. Lorenzo Bartolini, Caritas Educating (ill. 5). In 1817, the sculptor received a commission for a Charity from the great-duke of Tuscany for the chapel at the Villa de Poggio Imperiale. 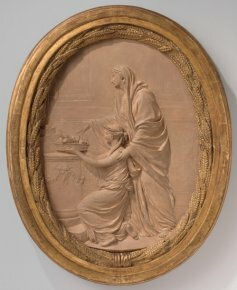 This work was to hang next to five other virtues executed by further artists (Francesco Carradori, Humility ; Gaetano Grazzini, Hope ; Ferdinando Fontana, Faith and Stefano Ricci, Innocence and Force). Bartolini spent a long time finishing his marble, claiming that there were in fact three figures, and not just one. The plaster cast was ready in 1824, and the marble it seems only in 1835. This work, original for combining the theme of Charity to that of Education, is today in Florence at the Galleria Palatina. The replica acquired by the Rijksmuseum  would date, according to the museum, back to 1842. This is therefore a third version, as a second smaller one (height – 155 cm) came up for auction (but remained unsold) at Finarte Milan on 17 April 2007. Thus, there are at least three versions of this famous group. Still under refurbishing for the last few years (it is not to open before 2012, after several delays), the Rijksmuseum only has limited exhibition spaces available at the moment. These five sculptures are on display there until 15 June. Collective work, La sculpture au siècle de Rubens dans les Pays-Bas méridionaux et la principauté de Liège, Brussels, Musées d’Art ancient, 1977. Collective work, Louis-Simon Boizot 1743-1809. Sculpteur du roi et directeur de l’atelier de sculpture à la Manufacture de Sèvres, Somogy Editions d’Art, 2001. According to the catalogue quoted in the preceding note, as their n°1 is a Vestal or Small statue for the Empress of Russia, in marble, signed and dated 1769. Let us point out that this work lists some lost pieces (for example a Louis XV standing, 1773, n°7), whereas others, like the Prix de Rome, do not appear. It was acquired at the Maastricht Fair from a Dutch dealer whose name was not revealed to us.